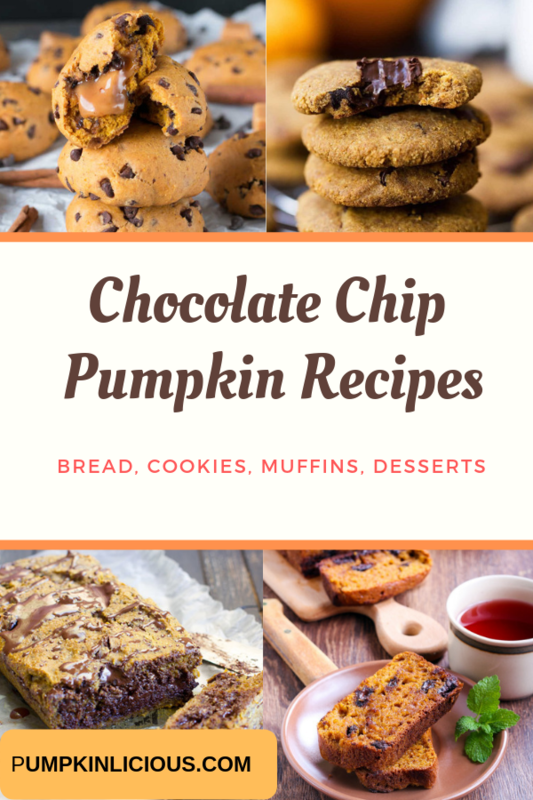 I love chocolate chips with everything including pumpkin! I thought I should write about my favorite chocolate chip pumpkin recipes, and hope you love them as much as I do! People look at me strange when I say I am using some of my fresh pumpkin to make chocolate chip cookies or bread! I get to say I told you so after they try one mouthful and they are hooked as much as me. Pumpkin Chocolate Chip recipes are hot hot hot at any time of the year! Of course you can use any type of chocolate, milk, dark or white. The other good news is that you can use vegan, dairy free and gluten free varieties also so that these treats are suitable for those with specific dietary needs. I had to share some of my favorites with you! I decided to break them down into categories starting with pumpkin bread recipes, then cookies and muffins, and finally other desserts! Everyone loves a good old pumpkin bread recipe from scratch, and what better thing to add than chocolate chips! As a teenager I was addicted to brioche rolls with chocolate chips. I used to beg my Mum to buy them every time we went food shopping! I can still remember the sweet smell of bread and chocolate. To be honest I didn’t think I would ever find a bread I liked better until I sampled my chocolate chip pumpkin bread and the rest is history! 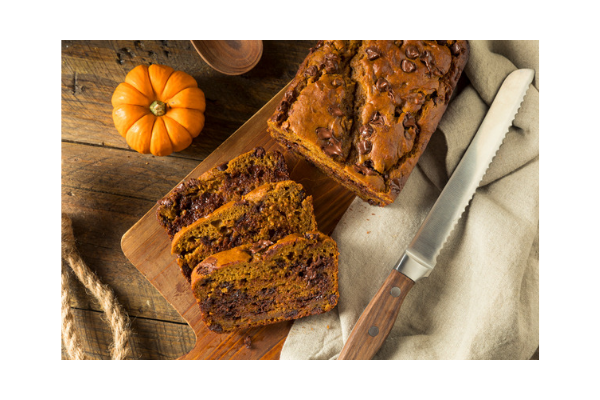 While I will always say I love my chocolate chip pumpkin bread recipe there are a few others that sound so good I really want to try them too. Bread Machine Pumpkin Chocolate Chip Bread – we all know I am a massive fan of bread machine pumpkin bread as the aroma and taste rocks so this will be one recipe I am definitely putting on the to do list. It is so easy for me as I already have a fabulous bread machine. If you have a sweet tooth you will be no stranger to a cookie or two, or maybe even a dozen at a time! Yikes when you just finish baking and the smell is tempting you and you cannot stop eating! Yep we have all been there. There are so many different versions of these online and I am sure they all taste awesome. I particularly love my easy chocolate chip pumpkin cookies but there are so many more worth trying! Low Fat Oatmeal Pumpkin Chocolate Chip Muffins – With just over 150 calories these are sure to be hit with those watching their weight. 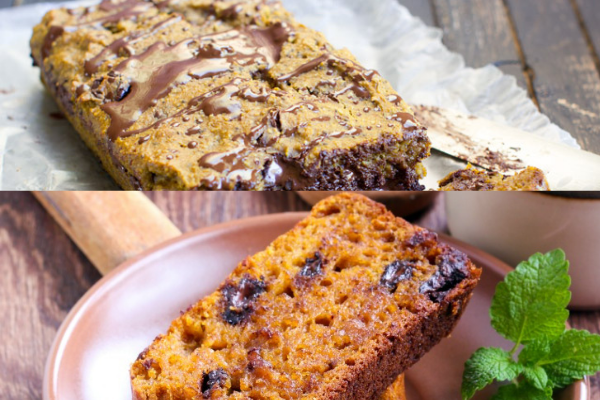 Pumpkin Chocolate Chip Bars by Two Peas and Their Pod – these are a classic and something I would love alongside a hot cup of coffee. Pumpkin Spice Chocolate Chip Whoopie Pies sound amazing – I could not find the website for these but the video makes them look even more appealing. If you have not had enough of a pumpkin and chocolate fix I can sort that with even more sweet recipe ideas. These are definitely not good for the waistline or those that like to count calories, but sure everyone deserves a treat now and again! I can bet the kids will be requesting some of these as a Thanksgiving dessert. Chocolate Chip Pumpkin Cheesecake by Moneywise Moms – this not only looks great but tastes good too. A useful tip here is to enjoy this chilled as opposed to heated. Chocolate Chip Pumpkin Poke Cake by SugarandSoul – poke cakes are dead popular and easier to make than you think. This one is basically a pumpkin spice cake with chocolate chips added. Which of these Chocolate Chip Pumpkin Recipes did you like the best?